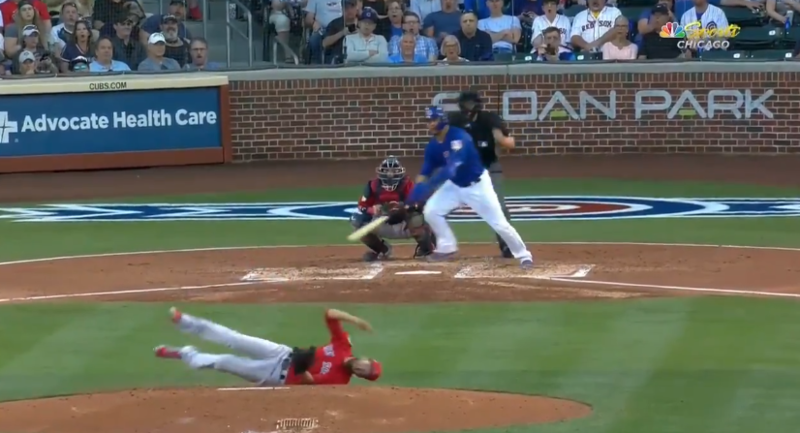 Boston Red Sox pitcher Rick Porcello is lucky to still have his head intact after Chicago Cubs catcher Willson Contreras hit him in the head with a line drive on Monday night. The line drive knocked Porcello to the ground, and the ball went all the way out to deep right-center field. There’s no Statcast data (because it’s Spring Training), but the exit velocity of the line drive had to be over 100 mph; the ball was smoked. Somehow, Porcello appeared okay and stayed in the game. He even laughed it off. That’s a pitcher’s nightmare, and it’s a bit surprising the Red Sox left Porcello in an *exhibition* game, even if he seemed to be fine.